Angular 2 in ASP.NET Core 1.0 are going to redefine web development experience for developers. Thinking of creating ASP.NET website outside Visual Studio IDE was nightmare, but with advent of ASP.NET Core 1.0 as truly open source cross-platform technology it so exciting to create these apps without Visual Studio IDE. In this tutorial I will summaries steps of using Angular 2 in ASP.NET Core 1.0 using Visual Studio Code as editor not as IDE. These steps can be similar if want to work on Linux or Mac OS. Running application using lite-server So let’s get started, I used Windows 7 OS with NPM (Node), TypeScript, Gulp, lite-server installed globally. These steps might similar in Mac OS or Linux or other Windows OS. ASP.NET Core 1.0 needs to installed as well. Angular 2 along with other dependent packages needs to be included in package.json. List of packages needed can be found from 5 min quickstart of Angular2 website. Create package.json file using ASPNET yeoman generator or manually create and copy below code. After that open folder containing project in command prompt and run npm install to install all the packages. Along with Angular 2, I have included bootstrap and Jquery packages so that I can use them later. 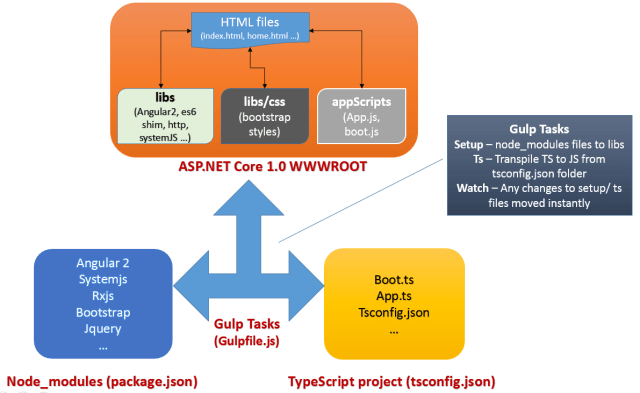 In ASP.NET Core 1.0 the wwwroot folder acts website root folder, so all static files like scripts, images, CSS etc should be placed this folder.Now that Angular 2 packages were downloaded into _node_modules_ folder, which contains numerous files. Angular 2 with TypeScript is something interesting to work with, in this web application we need TypeScript virtual project by including tsconfig.json file. tsconfig.json is TypeScript configuration file which does tell compiler what needs to be with TS files. Create a folder “scripts“, add tsconfig.json using yo commands or add the file manually. Copy below code to tsconfig.json. It tells TypeScript compiler to move tranpiled TS files to “outDir” by targeting them es5 standards. Any TS files in _node_modules_ is excluded, commonjs module loading is selected while initializing the JS files. We are working with Visual Studio Code, its just code editor so need to tell it to do transpile work for us because ultimately JS files are the one’s that need to be referred in HTML files. The gulp tasks code under is self explanatory with commented lines, to give much better visual representation go through below image. You might think so much get started with Angular 2 in ASP.NET Core 1.0, not really this is one time operation. Once done you can just create html pages, add TypeScript to work with Angular 2. If we want to run all gulp tasks above on Alt+Cntrl+B (i.e. Build), we need to tasks.json file and add these gulp tasks so that we can work with them. Just do _Alt+Cntrl+B (i.e. Build), _it will prompt that no task runner is configured do you want one. Just click on “Configure Task Runner“ and copy below code in it. From Angular 2 quick start link, it tells to create “app.ts“ and “boot.ts“ which acts as Angular component and bootstrap respectively. Just copy below code into app.ts, boot.ts and _index.html. _We are set now, next step is running application. If you observe “index.html” you will notice that we are referring systemjs.config.js, but where are Angular 2 related files.This is were the Systemjs configuration file will help us to load all necessary files. Create systemjs.config.js and copy below code. Configuration code is pretty simple - Looks for @Angular folder for packages, loads RxJs, hand written scripts related to application. I prefer using lite-server when working with Visual Studio Code is that it does lots of things like open browser, syncing any changes and more. When in VS Code, press F1 –> go for “Run Task“ and click “default“ - Gulp Task described above. It does create “libs“, “appScripts“ folder under wwwroot; ouput window shows that Gulp watch task is running and looking for changes. Open wwwroot in console and type “lite-server“ to see magic, everything works perfectly !! This project is available on Github, have a look. Also Checkout Angular 2 in ASP.NET Core 1.0 using Visual Studio 2015 IDE.